Four Bedroom Home W/ Pool. Close to Surf Break and Town. Kitchen/Dining/Living: Villa Rosetta offers a state of the art kitchen with granite countertops, stainless steel appliances, ice maker, and all the comforts of your own kitchen. You will find everything you (or your private chef) needs to create incredible tropical meals. The outdoor gas BBQ is perfect for grilling the catch of the day or select cuts from the local butcher. Our indoor/outdoor living-room/dining-room allows guests to be comfortable no matter what the temperature is outside. Water filtration system throughout the entire house. 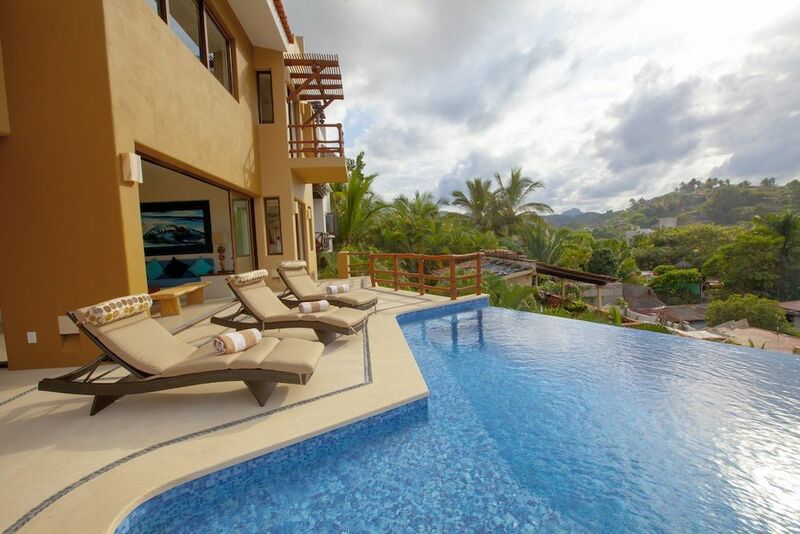 Terrace/Pool: From the terrace and in the pool, guests can gaze across palm trees, the village of Sayulita, and glimpses of the Pacific Ocean. The pool has a special shallow lounging area (6 inches) that is perfect for kids or reading a book. There is plenty of room and lounge chairs for everyone. The kitchen and icemaker are just a few steps away. Bedrooms: A/C in EVERY bedroom. All bedrooms are “master” on-suite bedrooms and have king-size beds with luxury sheets, lots of pillows, spacious closets, and full bathrooms. There is a private balcony with ocean view from every bedroom in the main house. The largest of the bedrooms has a Jacuzzi tub. Each bedroom is tastefully decorated with handpicked paintings and artwork from all over Mexico. You will love all of the bedrooms. (Two bedrooms have small couches that will easily accommodate a small child. The Apartment: The 4th bedroom is actually a self-contained giant one-bedroom apartment located just below the main house. This apartment has a full kitchen, private terrace, spacious bathroom, and separate entrance. The apartment is connected to the pool terrace via a separate staircase. One king bed or two twin beds available. What’s included: Staff service everyday except for Sunday. Boogie boards. Surfboards. Beach chairs. Umbrellas. Beach coolers. Beach towels. Drinking water. Ice.What else do you need? Villa Rosetta is truly an exception Villa, with an exceptional location, offering an exceptional vacation for all our guests. Guaranteed! We moved to Sayulita in 2000 and have started a small Internet business that allows us to live here and raise our family. Over the past 13 years we have also built quite a few vacation rental homes. Some we have sold and some we still own. We love sharing the beauty and joy of Sayulita with our renters. We built Casa Rosetta in 2013 strictly as a Sayulita Vacation Rental. The house is designed to provide the perfect atmosphere for a family or group of friends looking for a great rental. There are plenty of private areas and also large spacious areas for everyone to hang out. The location simply cannot be beat! You can walk everywhere and do not need a car. Beaches, restaurants, shopping, and bars are all close. Noise has never been a factor in this neighborhood except for standard Mexico like an occasional dog or chicken. Close to everything Surfboards, boogieboards, beach gear is all provided You will truly LOVE this villa! Awesome ocean views from the Jacuzzi terrace. Housekeeper will be happy to do your laundry for you. Stainless steel appliances and top notch cooking ware. Indoor/outdoor area with mood lighting. Surfboards and Boogie boards provided! With great views. Infinity pool. Yep! Seats six and is located on the top view terrace. You will love this villa!!! Sayulita is probably the best place on earth for a family vacation.